Embarking in a ship of Adramyttium about to sail to the ports on the coast of Asia, we put to sea (Acts 27:2). Adramyttium was a coastal city located at the head of the Gulf of Adramyttium, on the Caicus River in the plain of Thebe. 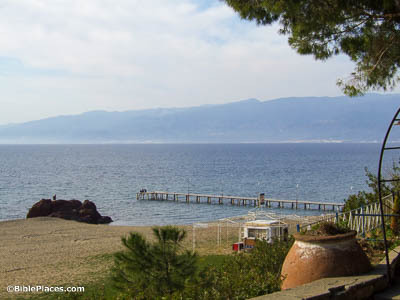 This is on the western coast of Turkey, not far from Assos or Mitylene on the island of Lesbos, two places Paul had visited on the return from his third missionary journey (Acts 21:14). 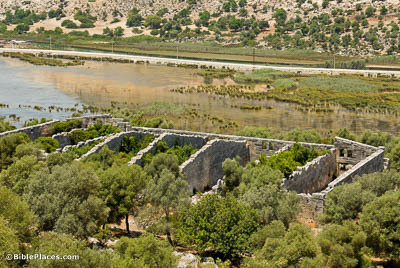 We arrived at Myra in Lycia. There the centurion found a ship of Alexandria sailing for Italy (Acts 27:5-6). Paul’s first ship was sailing to Adramyttium (on Turkey’s western coast), but at Myra (on the southern coast) the prisoners changed ships to an Alexandrian vessel headed for Rome. This transfer of passengers would have taken place at Andriace, Myra’s port (and a small city on its own). The ship that was headed for Rome was probably loading grain at Myra. Myra-Andriace was an important port which served the fleets transporting grain from Egypt to Rome. The granary pictured here dates to a little after Paul’s time, and it testifies to Andriace’s importance to the grain trade. We came to a certain place called Fair Havens, near which was the city of Lasea (Acts 27:8). Lasea was about 1.5 miles (2.4 km) east of Fair Havens. 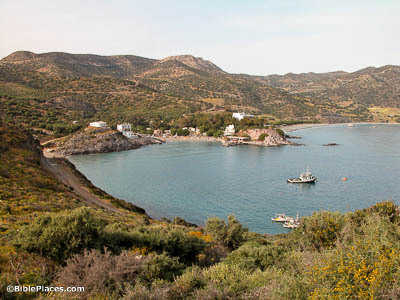 In the direction the ship was traveling (west), Fair Havens would have been the farthest harbor they could reach while staying in “the lee of Crete” (the side of the island that protected them from the wind). It seems that Fair Haven was truly only a harbor, instead of also being a town unto itself like many of Paul’s other stops. To their later regret, the ship’s owner and pilot chose not to spend the winter here. They weighed anchor and sailed along Crete, close to the shore. 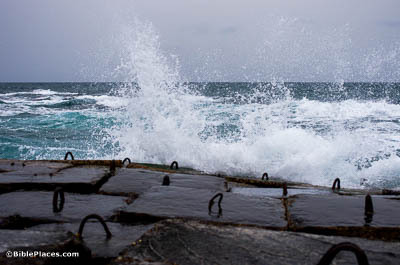 But before long a tempestuous wind, called the Northeaster, rushed down from it (Acts 27:13-14). An ancient writer named Vegetius (4th century AD) records that sailing in the Mediterranean after September 15th was dangerous, and after November 11th it was impossible (De re militari 4.39). According to the account in Acts, the dangerous season had already set in by the time Paul’s ship left Fair Havens. Consequently, they got caught in a seasonal windstorm that ultimately resulted in the loss of the ship. But striking a reef where two seas met, they ran the vessel aground (Acts 27:41). Though there are several options for where Paul was shipwrecked off of Malta, St. Paul’s Island is the traditional location. 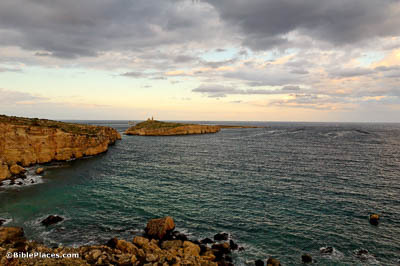 This uninhabited, rocky islet stands at the northern end of St. Paul’s Bay. Because the word “reef” here could also refer to any sort of sandbank or sea-encompassed landmass, there is no textual reason they couldn’t have wrecked on an island.